Initially a businessman keen on promoting Formula One in his home country of India, Vijay Mallya has been a force to be reckoned with since joining the sport in 2008. As team owner, and eventually team principal of Force India, the entrepreneur has tried his hand at many endeavours, brewing alcohol being his most successful. His enthusiasm for F1 seems to ebb and flow, but the team continues whether he is in the paddock or not. Vijay Mallya’s Formula One credentials were under question when he first arrived on the scene at the tail end of 2007. 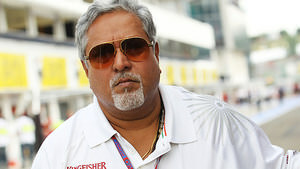 In a bid with Michel Mol, ownership of the Spyker F1 team transferred to Mallya, and the outfit was renamed Force India. Hugely proud of his heritage, Mallya seemed keen to promote motorsport in India, but wasn’t so keen on employing any driver simply because of misguided patriotism. As chairman of the UB Group, parent company of brewers that make Kingfisher beer, a dominant brand in India, Mallya has flashed the cash and dealt with the fallout afterwards as well. With talk of grounded airlines and frozen assets, the future of Force India has always been up for discussion, but so far all issues have appeared to stay out of the F1 paddock. With a clear aim to keep improving, Mallya took over the team principal role from Colin Kolles during a technical reshuffle after just one year. From initially tenth in the championship, Force India have gradually climbed, securing sixth in the 2013 season, with a few highlight performances, and a couple of missed opportunities. Mallya's enthusiasm for the sport has been rocked at times, and he is often part of controversial debates about where the regulations are going and how the costs sky-rocket, but so far, the team continues to participate. 10/02/2012 I'd love to support Nico, but will he have to kiss Vijay's lucky coconuts? And in case you missed it earlier, a sixty second recap of Vijay Mallya's discontent with Renault and his optimism for the coming season in today's F1Minute. Force India are ready to launch their new car. To kick things off Natalie Pinkham introduces their resident man-in-exile Vijay Mallya. Not every team can boast having one of these.